If a single point of failure can make hundreds of cluster nodes useless, you have a problem. We have the solution. Those metal pizza boxes may look harmless, but the wrong ones will make your users angry and your electrician rich. 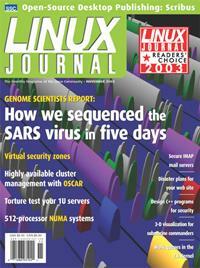 Linux on PC hardware formed the basis for an infrastructure to handle huge volumes of genetic data. An experimental US Navy program combines multiple sources of information into one 3-D display. You need to start running protein folding jobs—when? You voted. We counted. You're waiting. Take desktop publishing off the shrinking list of applications Linux doesn't have, and create press-ready documents with a new GPL program. If you don't have time to do it right, where will you get the time to issue a security warning and a patch—or worse, a device recall?